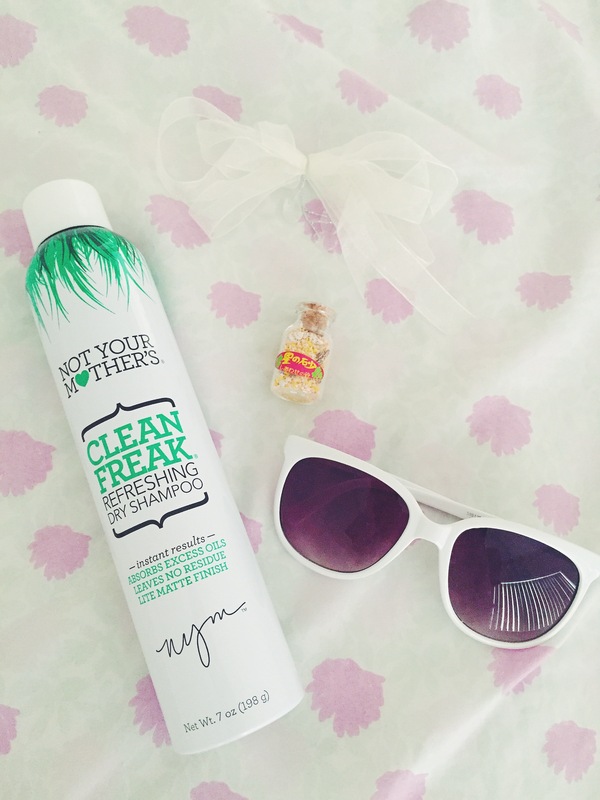 July 15, 2015 September 30, 2015 / Elizabeth T.
I’m back today with a product review, and it’s none other than Not Your Mother’s Clean Freak Refreshing Dry Shampoo! This dry shampoo was raved about by so many beauty YouTube gurus and bloggers, so I thought, why not give it a try? I have very fine hair that doesn’t have too much volume, but I’ve heard that dry shampoo can really help give locks that extra oomph. With the summer heat waves rolling in, my fine hair has been feeling a more limp than usual, so I thought, what a perfect time to give dry shampoo a chance? Maybe I got a bad bottle or something, but I’m just not feeling it 😦 Sadly, I think it makes my hair even more oily, greasy, and flat than it initially was. Just like any other dry shampoo, the product must be shaken vigorously before spraying generously onto the roots. The one good thing, though, is that it’s pretty affordable and easy to get, since it’s sold at most local Targets, Wal-Marts, and drugstores. Do you all have any other dry shampoo recommendations for me? I’d really appreciate it! 🙂 I really want to find one that works well and doesn’t smell too strong! Hope you all enjoyed this post, and I’ll be back again soon! Thank you for the great review! Will give it a try! Hi Carmen 🙂 Thank you so much for the recommendation! ❤ I'll definitely give the LUSH one a try! Thank you for stopping by Carmen! Thanks for stopping my Michele! Totally agree with you! I was super excited to use this after so many great reviews, but was also sadly disappointed. This product makes my hair feel so sticky and gross with barely spraying any on! Not sure how so many people like it. Aww I totally know what you mean 😦 So sorry to hear that you also had a disappointing experience with this dry shampoo. Hopefully we’ll both find one that works for us soon! Hello Elizabeth, thanks for a very informative and honest review, would want to give it a try but quite afraid of the smell, if it’s tolerable then I would. Any thoughts? Also, your hair is already beautiful on it’s own and suits your beauty, I suddenly miss long hair! Hi Raya! 🙂 Thank you so much for stopping by! And I would say the smell is definitely a bit strong for me, though it’s probably because I’m used to lightly scented products? And aww, you’re so sweet! 🙂 Thank you so much! Great post! Thanks for sharing! I hope you will visit my blog! Thank you so much for stopping by Lauren! 🙂 And I’ll definitely give the Dove a try ❤ Thanks for the recommendation! I don’t tend to use dry shampoo because my hair doesn’t really need it. I prefer to use oils. I’e heard a lot of youtubers rave about that dry shampoo too! Hi Aleeha! 🙂 Thank you so much for stopping by! ❤ I've heard a lot of great things about oils! Maybe I'll give it a try soon! Love the name of it… And glad to hear how it worked out for you. Thanks for sharing! Thanks for this amazing review! Will definitely try it!